A recent guest said “it was like staying in a Presidential Suite at a 5 star hotel.” Very spacious, open floor plan. All reviews rave about the place. Read them! 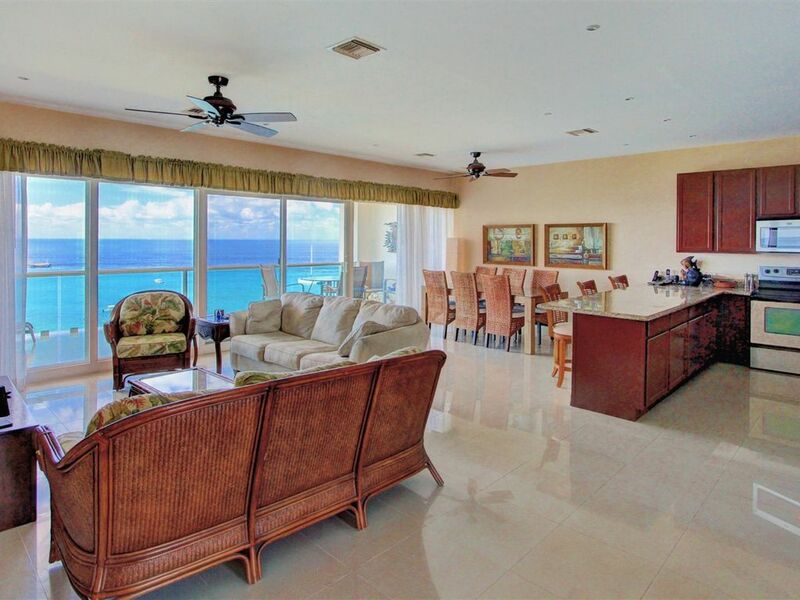 Our condo is located on the top floor of an elegant 8 story building----Palmar Condominiums. It is becoming THE place to stay in Cozumel for good reason. The grounds and building are very elegant and the amenities are first class. Our has wall to wall, floor to ceiling glass leading out onto a 35 ft. long deck with a magnificent view of the ocean! Look at the pictures. And, go to link to see more pictures/video of Palmar complex. A small ball/grill/beach club across the street provides easy access to one of the top shore snorkeling sites on the island as evidenced by the fact that many snorkel boat operators bring literally hundreds of their paying customers to this spot every day (see photo). This area also provides a nice shore dive as a warm up before diving the deeper reefs. While diving and snorkeling we have seen eels and lobsters in the coral formations just below our place as well of thousands of fish large and small. A beautiful very large private pool has a huge tiled area surrounding it with chairs, A Palmar residents holds yoga classes there twice week you can go to. The cabanas, shaded 'beds' and pool side wifi makes it a place you can hag out for hours and a hot tub offers a great place to watch sunsets. The pool area has become the gathering place of residents of Palmar and vacations renters. Most units in Palmar are owned by who are local professionals. Several others are Americans who live there permanently or spend several months a year in Cozumel. It is a great place to local meet people, hang out and watch the activity on the ocean. A private tennis court, game room (pool, ping pong) and gym are part of the complex and can be used by our guests. Palmar is situated in the 'south' hotel district which means it is about 5 minutes, by car/taxi, or a 25 minute walk from downtown. It is also right in the heart of lots of activity in the south hotel district. You can walk across the street to go snorkeling or to the dive shop and you have quick access to restaurants and shops, including a 24 hr convenience store located just below the pool area. As you will see in the photos the views are magnificent. By being on the 8th (top) floor your view 'from above' lets you clearly see the incredible variety of greens and blues that has made Cozumel's waters famous. You also have a wonderful vantage point to watch cruise ships come and go as well as sail boats, snorkelers and other boats seemingly dance across the sparking turquoise water during the day. Then, every evening you watch the sun set in the Caribbean. It is truly a magical place to stay. You might want to plan your day so you can enjoy the beach, water or town during the day & be home to enjoy watching the sunset from the large balcony which is where we find ourselves spending most of our time. Mornings are glorious......breakfast on the balcony while looking down into the incredible water is something we never tire of. We also like the fact that the building does not directly face west. The building was wisely designed slightly facing south so you get the sunset views without the afternoon sun making it too hot to enjoy the balcony as the sun goes down. This may seem a small thing...it is not. Many condos face directly west and although views can be good it is too hot to be outside until after sunset. The buildings layout also knocks down wind. We have sat on the balcony and watched storms blow across the sea with lightening flashing in the distance. Quite a show. We have taken pains to decorate the condo beautifully and to furnish the kitchen with first class cookware and other things needed by those who love to cook. If you prefer to have a local cook for you that can be arranged at a reasonable cost by our local property manager. There are two bedrooms and each has its own bath. There is a queen sized pullout couch in the living room and a guest bathroom near the entry way so people staying on the pullout do not have to bother fellow guests in the middle of the night. For divers, the dive shop across the street (Del Mar Aquatics) offers 10% discounts for people staying in our condo if you do at least 3 days of diving with them. It is a top notch, full service shop. They also have lockers for your gear. Our local property management company will make sure you get settled in and check in every 2-3 days to insure your stay is what you hoped for. They can also coach you about things you want to know about.........things to do, places to shop, restaurants, etc. As you can tell by reading this we intend to make this a first class condo that you will remember staying at for the rest of your life. We think this is why so many people staying with us keep coming back! We love Cozumel and want you to love your stay. I love talking about Cozumel so feel free to call me with questions. Cathy and I live in Colorado and LOVE Cozumel. She is an attorney and I am the Director of a human service agency. After visiting Cozumel for 25 years we were fortunate enough to buy a truly spectular condo that we hope to spend more time in as the years pass. Palmar is a first class property so it is a wonderful place to spend time when you are not out and about. Cozumel is a very relaxed, laid back place to be and has some of the best diving in the world. We love the specific area in which our place is located. As you can see in photos the cruise ships come and go in front of our place. Those floating cities create a romantic magic that is a source of entertainment in the morning when they arrive and even more so when they depart...at sunset...lit from stem to stern. Plus, there is a lot of small boat activity in the waters below our place that we find entertaining. We chose to be on the 8th floor because it provides a front row seat to an ocean full of activity. We also chose this location because we did not want to be too close to town. Being in the 'south' hotel district means you are closer to the really great beaches which are a few miles south of town. If you are in the 'north' hotel district you have to drive thru town to get to the best beaches which can take an extra 15-20 min. Last but not least, the owners/managers of Palmar are totally committed to making Palmar a gem on the island. As you will see in guest reviews the staff is very friendly and helpful and when issues crop up are very responsive to us and to our guests. Most people living in Palmar are year around residents are are successful business people on the island. It is a great mix of Anglos and Mexicans which makes it feel a less touristy. This has been a wonderful plus for us and something that is impossible to get in a hotel full of tourists. easy access to elevator and condo. no steps to navigate. This was our second consecutive year at Condo Palmar in Cozumel, staying six weeks this year. This was our first time staying in condo 8D owned by Terry Benjamin and his wife. We met Terry last year while staying in a different unit. He is a very delightful guy and I feel like we have become good friends in a very short time. The condo is beautiful, and they just did a complete remodel of both bathrooms and some upgrades to the kitchen. We especially enjoyed being on the top floor, making it much quieter. Also, it makes for a spectacular view. We are avid tennis players and scuba divers. So Palmar is the perfect place for us. The complex has one, just recently resurfaced, beautiful tennis court and is only a five minute walk to Roberta's Scuba Shack, our favorite dive center on the island. Alex, the property management employee, is very friendly, efficient, and responsive in addressing any issues and making sure everything is perfect for our stay. My wife and I, being retired, travel 40% of the year. A lot of trips are to dive, others to hike and explore other countries. But Cozumel keeps drawing us back. The ease of getting there and having such a great place to stay at Palmar makes the decision as to where to go very simple. Not only is Terry's unit 8D perfect but also the entire complex is very well maintained. The only negative I can give it is that at the time of the year that we go the pool is quite cold. It is a huge swimming pool and it would cost a fortune to heat. But the hottub is great to warm up again! We have already booked for next year as it has become an annual trip for us. If you are in to beaches, Palmar is not the place to stay. However, there is great snorkeling directly across the street. We love it because it is not a resort. It is very quiet and peaceful. Give it a try, I'm convinced you will love it. Thanks for your wonderful review Chad. It was a total pleasure to have to stay in our place. And, you were most helpful in working with staff to finish up a few little details on the remodel. Look forward to having you back this coming December. Happy travels. We enjoyed staying at Terry’s condo at Palmar. Terry has the top floor #8D at this beautiful complex. It’s perfectly situated nearby the international cruise terminal and has a fantastic view. It’s nice to see the lights of the ships come in the early morning and leave in the evening. Makes for peaceful evenings near shopping and restaurants. Terry’s condo is super clean, large kitchen, 2 large bedrooms with full baths, and great wifi service. Scuba with Mario over at Tikila’s rents tanks for $10 if your scuba certified, so good for some afternoon exercise. The back entrance to Palmar over by the pool means you can walk over to the water in 5 mins for a swim and shower in less than an hour. Palmar’s got a rinse area for gear by the showers too. Never tire of going back to Palmar as this is probably our 12th time staying there over the last 7 years. You can see the area from the balcony where cruise ships drop snorklers. If you like to snorkle you can walk to the same location and do it for free. There’s even a fresh water shower there and stairs for easy entrance into the water. Afterwards you can have appetizers and a margarita from Tikila’s while you watch the sunset. The food there is good too, but we usually buy groceries at the local Mega, Chedraui, or Soriana’s grocery stores. So glad you had a great time in Coz enjoyed the condo.....again. It really lets me know we are making folks happy when the come back. See ya again soon. How is this property not booked every week of the year? We loved our stay at Palmar Condos. This was our first international trip with our son, who is 6 months old, and things could not have been easier. I could go on and on, but I'll share my highlights. - The condo was well appointed with all of the basics, plus a lot of the things that I typically pack for vacation including snorkels, a beach bag, blow dryer, pool floats, pack n' play with bedding, etc. - The owner was very easy to work with and it was great to have Alex be so easily accessible for advice. - The pictures are very accurate and everything is as described. - The pool is perfect for kids because it has a 1 foot area and then gets deeper. Plus the pool was open 24/7. - The location was great with good snorkeling across the street and a lot of restaurants nearby. It was also very safe. - Everything about this unit and the property were perfect. I would like to offer one bit of advice. The restaurants in the area cater to the cruise traffic, so they close somewhat early. My husband and I were going to grab a drink after dinner (about 8:30 on Friday night) and nothing walkable was open. We got a drink from the room and went to the pool, so it wasn't a tragedy. If you're looking for nightlife, downtown is about a $5 cab ride away. Try Sunset Beach Restaurant for breakfast. You won't be disappointed. We like perfection!!! And, I am so glad your son's first international trip was to Cozumel and our place. That is the first trip my son made as well. Hope you have many more great adventures. Maybe see ya again. We loved our stay at the Palmar. Terry was very accomodating and Alex the property manager was awesome help. We look forward to staying here every time we visit Cozumel! I loved that you loved our place Chad and really happy you will be staying here when you come to Cozumel again. This was our third 10-day stay. Everything was perfect as always. We spend every evening watching the sunset from the balcony with a glass of wine. We will be planning our next stay soon. Palmar is in the 'south' hotel district. Lots of new shops, restaurants, bars, etc in the area. All within 5-10 minute walk. Price is for 4 people. Additional adults (up to 6 total) are additional $25.day. Total price includes a cleaning service when you leave. Additional cleanings about $25.